During the boom of the 80’s, the economical growth of Bangkok overtook the rest of the country. This phenomenon involved a rapid urban growth of the Thai capital. While at the end of the 20th century 7 million people were living in Bangkok, 10 million are predicted for the year 2015. In 1997, when the Asian economical crisis suddenly froze the dynamic of the city development, the Thai Baht was devaluated to 50% of its original value. At the same time when the Thai government was forced to stop the development of infrastructures and public equipments, local investors froze their projects. About 400 construction sites, sprawled all over Bangkok, were abandoned. Among them car parks, office towers, hotels, malls and highways. 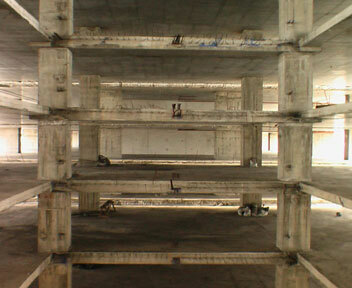 What’s left over today are skeletons of concrete, which offer thousands of vacant overlaying platforms in the city. In the last few years the importance of Bangkok as a financial pole in South-East Asia provoked the rising up of the land price in down-town, involving social discrimination.